Atletico Madrid striker Diego Costa has withdrawn from the Spain squad with a leg injury. The Brazil-born 25-year-old, who has won two caps for his homeland, and was named in the squad to face Equatorial Guinea and South Africa. He qualifies through residency having joined Atletico in 2007. 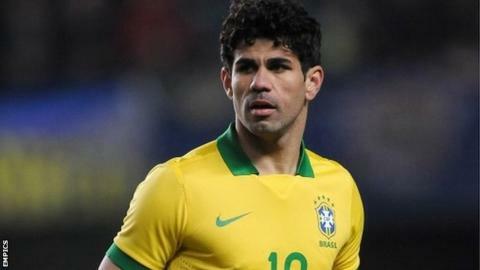 Costa played for Brazil against Russia and Italy in March, but friendly games do not commit international players. He was left out of the Brazil squad for June's Confederations Cup and is not tied to one country until he has played in an official competitive game. He has scored 13 goals in 13 La Liga appearances this season. for the upcoming friendlies with Chile and Honduras. Scolari added that "Spain should respect Brazil's right to choose its players" and accused Costa of "turning his back on the dream of millions". Speaking last week, Costa admitted the decision to switch allegiance was a difficult one. "It was very difficult to choose between the country where you were born and the country that has given you everything," he said. "I looked at everything and saw that it was right and best to play for Spain because this is where I have done everything. All that I have in my life was given to me by this country." Costa is the fifth Brazil-born player to be included in a Spain squad following Heraldo Becerra, Catanha, Donato and most recently Marcos Senna. He has been replaced by Juventus striker Fernando Llorente in the squad. Holders Spain will defend their World Cup title in Brazil next summer. Is Diego Costa the man to break the mould?